I don't know about you, but I have always been a fan of paisley. I am talking about the pattern not the singer, although I am a fan of his as well. When I saw this skirt at the J.Crew outlet this summer I just knew I had to have it. but can see so many possibilities in it's future. I decided to play up the orange in the skirt today with fun accessories and sandals. Pardon the garage pictures today. It started pouring rain as soon as I headed for home today. Speaking of rain, thanks for all the good thoughts about my friends and family in Louisiana and Alabama. So far, most are just waterlogged and keeping an eye out for flooding. Are you a fan of paisley? Such a cute skirt! 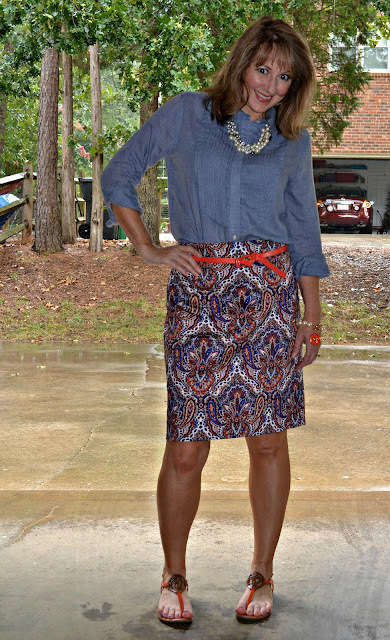 Love it paired with the chambray and how you wore the orange accents. The skirt looks silky? Gorgeous skirt - the colors and detail are so rich. The chambray shirt is a perfect pairing. Love the skirt on you...it has many colors in it, which will give you endless styling options! paisley looks fabulous on you! I had a paisley-obsession back in the day! I love those colors on you Brett ;) I am not sure if paisley will work on me ..
One of my favorite outfits on you! Gorgeous! Holy cow! I JUST ordered that exact skirt and a chambray shirt for my sister. Shhh, it's a secret. It arrives at her house tomorrow. I pictured her wearing them together. I will have to send her the link to this post after she gets them so that I can show her how to wear it. One of my favorite outfits of yours! You know I love paisley! I regret missing out on that skirt - it is such a pretty pattern! Oh I love paisley! You look fantastic. I never find anything good at the j.crew outlet. OK I never find anything at the price I want to pay at the jcrew outlet. I love that skirt, you look great Brett and I am glad to hear your family is doing alright in the South. Isaac needs to stay away. You know, I don't think I own anything paisley ... not sure why, I guess I just don't see it that often. But I love it with your fun accessories! Glad everyone's safe and sound (if not a bit wet!) I don't know who I like better, your gorgeous paisley skirt or the gorgeous Brad! ok, that pencil paisley skirt is perfection! I love this outfit. The skirt and blouse are fantastic. The set is beautiful belt and sandals. Very pretty. 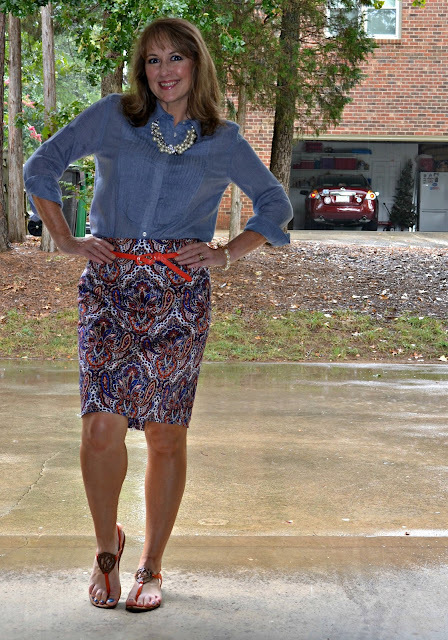 I think your garage pics turned out great, and I love the combo of the chambray shirt and paisley skirt. I couldn't have walked away from it either! Paisley can be a very versatile print! I love it paired with the chambray shirt - it's really perfect! I have a paisley maxi dress that I love. It's a fun, unexpected print! Me too! I think paisley is great, although I'm not sure if I have any paisley clothing. I think I tend to decorate with it more-- I had a beloved paisley duvet cover all through college that I replaced with another paisley duvet cover last year. love this whole look! out of the park!! Brett, this is so beautifully styled. You look gorgeous. dawn suitcase vignettes xo I like the garage photos...good lighting. I love this outfit!! I'd wear it in a heartbeat. 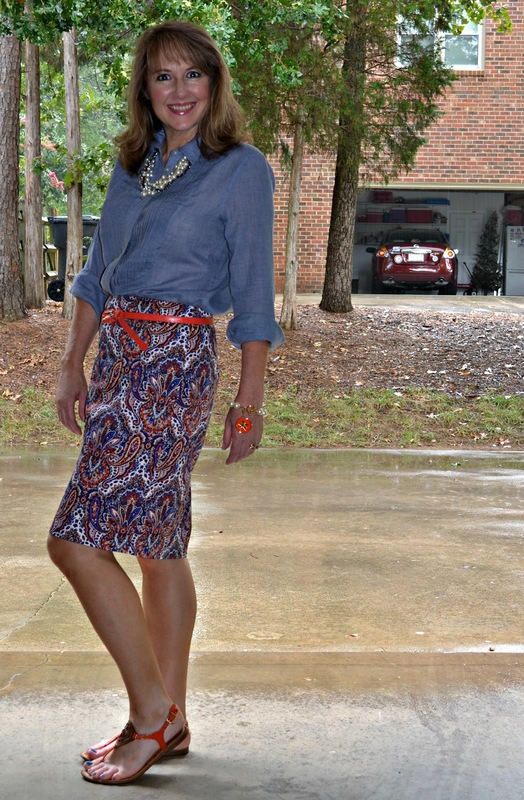 Can't go wrong at the J.Crew outlet store :) Love mixing chambray with a print!